The 2019 Full Year Calendar is a very simple and easy to navigate template divided into months with the option to add entries for each date. You can easily plan out your full year, or go month-by-month in this Excel sheet. Download the calendar Excel sheet using the link below and view the first page of your calendar setup. Start by changing the year to 2019 (or whatever year you prefer) and what day you prefer your calendar to start on. The months will automatically adjust to fit the dates and days of the year you enter. Next, go to the bottom of the page and you’ll see each month displayed in a different tab. 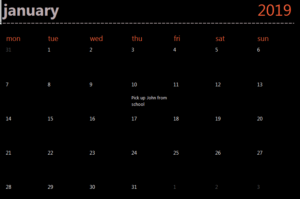 Start by clicking on January which will display each day of the month in a box where you can enter text. Keep these entries short, but add a time if needed. On the right side is a Notes section. This is where you can put overall monthly tasks and goals, along with more details about what you’ve entered into your calendar. Fill out what you can for the rest of the month tabs and you’ll be finished! Keep a copy in your Excel program and add entries as necessary. Also, print out the current and next two or three months to carry with you. Pencil in new appointments that pop up and add them to your Excel file later. Holidays aren’t automatically added, so you’ll need to add them yourself if you want. Use Excel’s cross-out tool to remove items that have been finished. You can also use the highlight, bold, and color tools to code your different appointments. Use this calendar for your personal life, business assignments, or even fitness goals. For example, schedule hiking for every Saturday and biking every Thursday. As the months progress, you can add more activities.